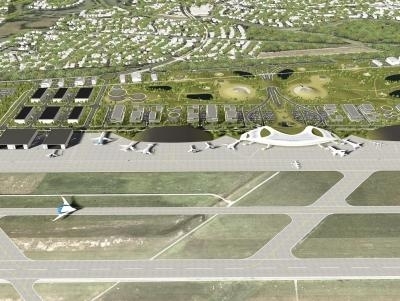 The Houston Airport System unveiled part of its vision for the future of Ellington Airport (EFD) today, as conceptual renderings of a possible Spaceport were released to the public. 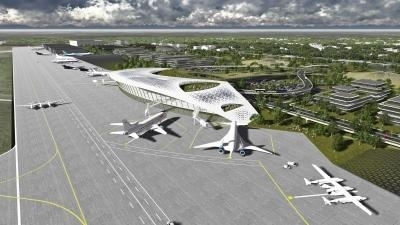 The design/drawings capture various elements of the overall project, including a terminal facility, an aviation museum and the accompanying aerospace industries that would most certainly arrive should Houston become the nation's ninth licensed Spaceport. "This is a new and exciting sector of the 21st Century economy that carries amazing potential for growth," said Houston Mayor Annise Parker. "We believe a licensed Spaceport in Houston would not only serve as an economic generator for the city but it would also enhance Houston's well-deserved reputation as a leader and key player in the aerospace industry." Houston City Council members agreed with that assessment on July 17, 2013, when they voiced their overwhelming support for the pursuit of Spaceport licensing at Ellington Airport. Should the required licensing be secured, the Houston Airport System (HAS) would move forward in establishing the required infrastructure and support facilities needed to accommodate enterprises such as space vehicle assembly, launching of micro-satellites, Astronaut training, zero gravity experimentation and space tourism. "It's important to realize that this type of work is already taking place today," said Houston Aviation Director Mario C. Diaz. "This is not a conversation based on science fiction or futuristic projections. This is a conversation about how Houston can access and enhance an industry that is already well-established and growing exponentially." The city of Houston stands as an ideal location for a future Spaceport, featuring a booming economy with a strong aerospace industrial base, a well-educated workforce with experience in the high-tech demands of space exploration and plenty of room for growth at a strategically located airport facility. Situated near the Gulf of Mexico, with ample available space for development, Ellington Airport seems tailor-made for the requirements that are associated with an operating licensed Spaceport. Diaz says licensing from the FAA could come as soon as next year.